I was honoured this week to be named winner of the 2018 Amnesty International Blogging Competition. The piece I wrote, “Stateless in Shatila: Palestine’s Perpetual Refugees” was a reflection on the few days I spent in a Palestinian refugee camp in Beirut. Although this happened over a decade ago, the situation for Palestinians in Lebanon (and in Palestine) has remained unchanged since then. When I’m asked where I’ve met the kindest people in my travels, Shatila Refugee Camp always comes to mind. Along with two other Australians, we were invited to endless cups of tea and meals by people who had next to nothing and still offered us everything they had. A Jordanian woman, who had moved to the camp to run an NGO, told me they lived in uncertainty, not knowing from one day to the next whether they would still be alive tomorrow. I was amazed by the resilience and kindness of humans living under such extreme conditions, and wondered how they didn’t resent my ability to walk back out of the camp and get on a plane home. But perhaps they did. 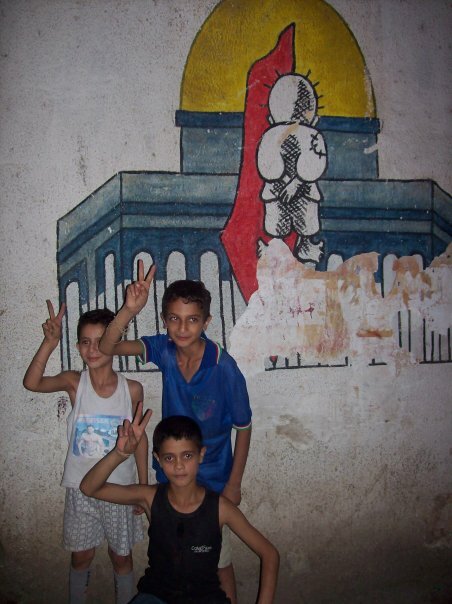 We came to Shatila because we thought we could volunteer our time and energy. On arrival, we found the camp in chaos with refugees pouring in from another camp in the north, which was under bombardment by the Lebanese military. At the Children and Youth Centre, we asked director Abu Moujahed how we could help and he replied with frustration, “Do you speak Arabic?” It was arrogant to assume we could do anything for the Palestinians that, in three generations of suffering, they hadn’t learned how to do for themselves. The only thing I could think of was to write about the people I met and hope that some day someone might read it. The boys in these pictures will be adults now. Most likely, they’ll still be living in Shatila, without citizenship or working rights. And there’ll be a new generation of Palestinians born into the camps and playing with pocket knives because they can’t afford a football.